It has been said that the key to enjoying life is to add a little touch of spice, and now the same can be said for whisky. Although spiced rums have been on the market for a number of years now, it has only been recently that some Canadian distillers have begun to introduce spiced whisky to the market. The results are outstanding, spiced whiskies have the same warmth of their traditional cousins, but they also have hints of cinnamon, vanilla, nutmeg and ginger. 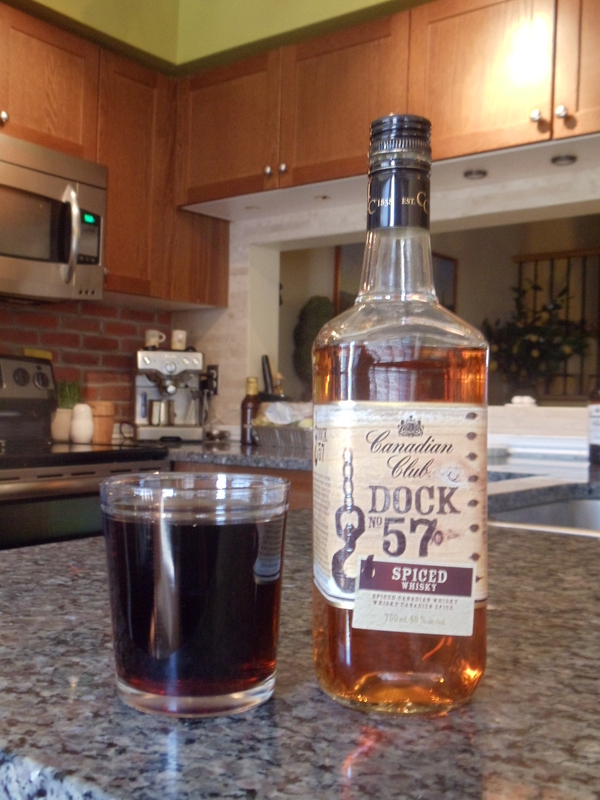 Canadian Club Dock 57 is the third spiced whisky that I have sampled, and it is clearly my runaway favorite. It is named after the infamous Dock 57 in Windsor, Ontario where bootleggers tried to send shipments of whisky across the Detroit River during the time of American Prohibition. I enjoyed my first drink the same way I traditionally drink my Canadian whiskies, I mixed my Dock 57 with cola. I was pleasantly surprised that this whisky which is 40% alc/vol was so smooth and inviting, there was little scent of the whisky itself, yet the spices hadn’t provided an overpowering taste. With each sip I found a mellow whisky that wasn’t overrun by cinnamon, something I find happens too often in other spiced whiskies, and spiced rums. There was no additional warmth in the bottle, just what occurred naturally in the spirit. I would have liked to have some limes wedges on hand, not just for esthetic reasons, but a quick squeeze of lime would have been the icing on the cake. This spiced whisky is simply amazing. It’s much mellower and smoother than other Canadian Club products, and it has a tremendous balance of spice that works together for an extraordinary finish. Here’s how I would recommend enjoying Dock 57. As I was having a drink outside under the evening sun, I had totally forgot that I had not put any mix in my glass. Without paying attention, I took a fair size drink from my glass and it wasn’t until half the whisky was gone that I noticed I was drinking my Dock 57 straight. This is when I realized that this drink is dangerously mellow. Had that been a measure of a traditional rye, I would have pulled a face and made a swear, but I barely flinched. At that point I was grateful that Dock 57 only comes in 26oz bottles, as it disappeared with such little effort, having any more on hand could have been a prelude to a much harsher wake-up the following morning. As for having a little more spice in my life, I’ll take mine with some cola and a slice of lime.